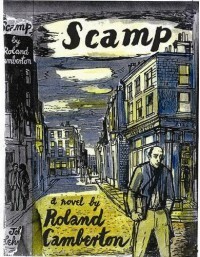 Scamp is another of those classic London novels from the 1950s that evokes Julian Maclaren-Ross, Patrick Hamilton, Norman Collins, Samuel Selvon and so on. It makes a brilliant companion piece to Adrift in Soho by Colin Wilson. The back streets of Soho and the West End are brought vividly to life and, whilst the plot is slightly inconsequential, that doesn't make the book any less enjoyable. Every page provides an opportunity to experience late 1940s bohemian London and, as I think we can all agree, that is a wonderful thing. Julian Maclaren-Ross makes a few appearances as "Angus Sternforth Simms", who is usually to be found in The Corney Arms (a thinly disguised version of his home-from-home The Wheatsheaf pub). Indeed the sections of Scamp that take place in The Corney Arms could have come straight out of Paul Willetts's biography of Julian Maclaren-Ross "Fear and Loathing in Fitzrovia". "The book is written from the standpoint of the "bum": that bearded and corduroyed figure who may be seen crouching over a half of bitter in the corner of a Bloomsbury "pub"; it is ostensibly concerned with the rise and fall of a short-lived literary review, but Mr. Camberton, who appears to be devoid of any narrative gift, makes this an excuse for dragging in disconnectedly and to little apparent purpose a series of thinly disguised local or literary celebrities." Despite Julian Maclaren-Ross's negativity, the book won the 1951 Somerset Maugham Award (given to authors under the age of 35) and I can quite see why. The book's great strength is its evocation of late 1940's London and in particular the areas of Bloomsbury, Soho, Kings Cross, Fitzrovia, Fleet Street, and the multifarious and compelling bohemian characters that populate this world. The book was out of print for many years until publishers Five Leaves, through their New London Editions imprint, republished it in 2010 (they've also republished two books byAlexander Baron which I have on my shelf and will be reading soon). I love books like this and am delighted that more of these titles are getting reprinted. There's a beauty and a purity in the shabby streets and seedy cafes and the lives lived on the margins. Not only that, but as the story went on the more quietly profound it became as Camberton muses on maturity and the loss of youth, and how being poor and bohemian loses its allure after a time. Sadly Roland Camberton only wrote one other book before giving up writing, Rain On The Pavements, and that has also been republished by Five Leaves. Whilst about halfway through this book, and filled with enthusiasm for Roland Camberton, I got hold of a copy of Rain On The Pavements yesterday which I will read sometime soon. It's such a shame that there's only two books to read, still we should savour these two novels and be grateful to Five Leaves for bringing them back into print. Both novels have been reprinted complete with their original cover art by John Minton which are both beautiful artworks and really compliment the contents and enhance the reading experience.